Do You Care About Your Age? “I’m as old as my tongue and a little older than my teeth”. I care not a jot about my own ageing, although I do care about femageism (more on that later). I’m grateful to still be around, having lost so many good friends over the years. I was reminded that other people do care a lot about age on a recent trip to the pharmacy. I had to get a double dose of antibiotics (alas, not caring about growing older doesn’t mean I’m immune to its effects on my body), and I went to pay for my prescription. The assistant said I didn’t have to pay. Oh but I do, I said, I always do. No, you don’t, she replied. I looked perplexed. She then surreptitiously pointed to the line on my script which said I was 60 and quietly mouthed that as I was over 60 I got free prescriptions, rather in the manner of giving me a cure for some socially embarrassing disease. Or a nit spray. I do appreciate the sensitivity of the young assistant who has no doubt been trained to be very careful about audibly sharing personal information, but it made me smile. Age is only an issue because of the negative connotations associated with it. Logically we should rejoice in it and the advances we have made in the western world. It is an issue for everyone, but particularly so for women in industries where they are lauded for their looks and suffer so much when they age. I’ve written before about how ageism is probably the last ‘ism’ we can all truly indulge in without being accused of non PCness. (See Femageism here). As much as we haven’t learned to hear authority on women’s voices, we haven’t learned to appreciate the beauty and wisdom of the older woman. The media plays a large part in this, although I do detect a slow softening of old attitudes in some arenas. 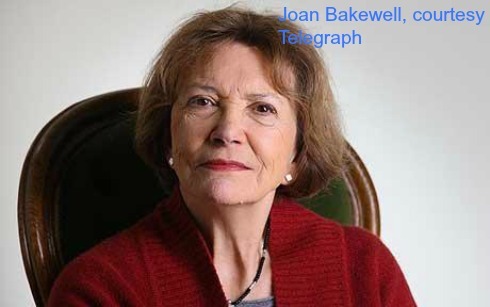 The photo is of writer, journalist and broadcaster, Joan Bakewell who at 80+ is still working regularly in TV and radio. Lang may her lum reek! Speak Up is now available in an audio download! For professional women anywhere. Click here for more details.